Sound familiar? It can often feel as though siblings argue about just about everything. While such conflicts can feel exhausting and often overwhelming for parents, these moments can also be opportunities to teach your children the skills to manage misunderstandings. In Alistair Cooper and Sheila Redfern’s book, Reflective Parenting, the authors provide insights into how to support your children in working through their disagreements and shifting from competitiveness and conflict to cooperation and appreciation. If you have a partner, spouse, or co-parent, keep in mind that your children are keenly aware of how you two are interacting. Model for your children what you hope to see in their relationships with their siblings. This could be as simple as listening closely and attentively to what your partner is sharing and showing empathy for how they are feeling. This also means resolving conflicts between you and your partner in a respectful way. Your children will especially notice when you appreciate a perspective that is very different from your own. If you grew up with a brother or sister, you might remember how annoying they could be at times. Communicate to your child that you understand how frustrating it can be to have a sibling. If there is a disagreement or a conflict, validate and empathize with each of your children’s feelings, communicating to them that you understand why they are upset. It is not easy having a brother or sister with whom you have to share space, toys, and attention. If your children feel understood and validated, they will be much more likely to let go of their resentful feelings towards their sibling. If they feel as though you understand their perspective, they are much more likely to consider the thoughts and feelings of their brother or sister. 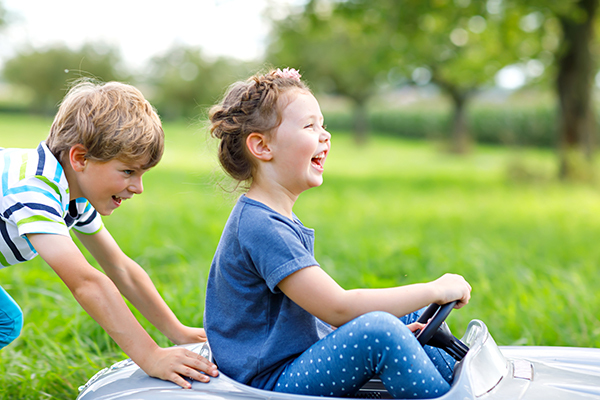 Sibling misunderstandings are perfect opportunities to teach your children to recognize and even appreciate the thoughts, feelings, and desires of others. Perspective taking fosters caring, respect, and fairness and helps children realize that others have minds of their own. When there are disagreements, encourage your child to step into the shoes of their brother or sister by asking questions such as, “How would you feel if …?” Such supportive questions help children stretch beyond themselves and develop an understanding of the minds of others. While it may be tempting to rush in and resolve a conflict between your children (and there are times when you must intervene for reasons of safety), allowing your children to try to work out misunderstandings on their own provides them with opportunities to learn the essential life skills of cooperation and problem solving. While they may need you to help resolve a conflict, try to wait for your children to work it out on their own. Pay close attention to the disagreement and imagine the perspective of each of your children. This will help you develop an understanding of why your children are arguing, and help you guide them in coming up with solutions. Join our Parents Place workshop, Sibling Relationships, to gain invaluable tools to help develop positive relationships as well as manage rivalry and conflict. Weds., March 20, 6:30-8:30 pm, in San Francisco. Maneesh Saini, LMFT, is Senior Clinician at Parents Place, San Francisco. He provides consultation and therapy to families and children of all ages. With workshops, counseling services, and expert resources, we’ve got the tools to help families thrive. Set up a consultation to discuss your specific situation.